This past Sunday, I attended another class at my local Pottery Barn. This seasonal class was all about outdoor/backyard entertaining, perfect for those looking to throw engagement parties or bridal showers this summer. And the tips are well-suited for weddings themselves or the casual get together with friends. I attended one of the Pottery Barn classes in the spring that discussed tips for decorating and entertaining for a brunch. Below are the easy to use entertaining tips that have been organized into 3 sections based on the multitude of notes I took . . .
3. 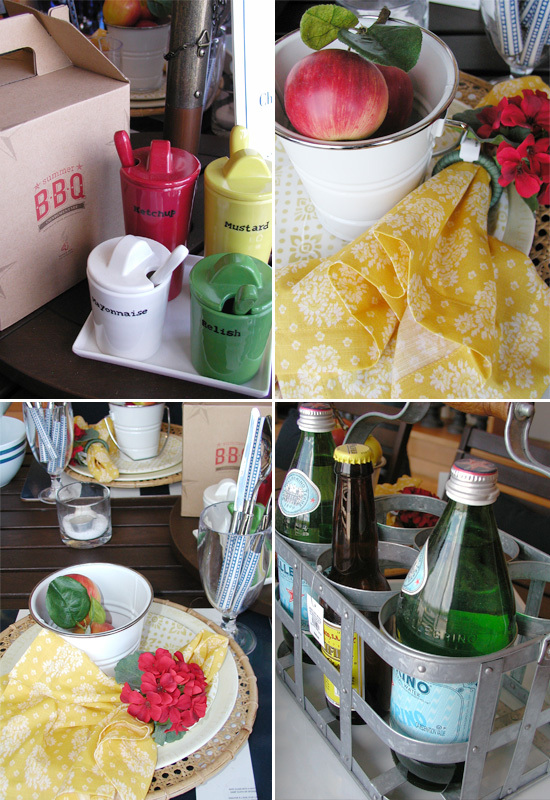 Add fun elements: such as enamel pails which can be used for serving appetizers or fruit, as a holder for napkin of guest, etc. 4. For an upscale look that's also "green", consider using linen napkins: even though it's a casual dinner, linen napkins will create a prettier display on the table and it's the little touches that make the dinner extra special for your guests. 6. Another item that is coming back in style for casual entertaining is galvanized serving ware: consider wine/glass bottle holder, trays, etc. And, a plus side to galvanized is that it won't rust. 1. For the buffet table, you will want to keep the centerpiece at the back of the table: this way guests aren't reaching over the displays when reaching for food. 3. Have silverware and napkins available at the end of buffet table: guests don't need to be juggling their plates, the silverware and spooning the food onto their plate. 7. Keep fork, knife and spoon together: to make it easier for guests to pick up their silverware at the end, wrap the silverware in a napkin and tie with twine. It also creates a lovely display as well as making it easy for your guest to grab and go. And, lastly . . . with some simple pre-planning, it will be easy for the host to enjoy the party too. Cold Dishes - prepare the day before and store in the fridge.